Gorillaz have shared the mind-bending new video for the song “Tranz” off their latest album The Now Now. The video marks the first live appearance of the “virtual band” since their 2010 performance at the MTV EMA’s. The video reunites the motley crew of cartoon musicians created by Gorillaz co-founders Damon Albarn and Jamie Hewlett. 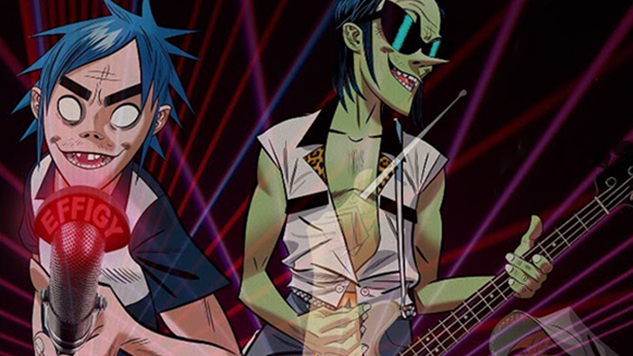 Singer 2D, guitarist Noodle and drummer Russel Hobbs are all back and ready for action. The only one missing is bassist Murdoc Niccals, who, in the Gorillaz “universe,” is in jail. He’s replaced, oddly enough, by Ace, a character from the Cartoon Network classic Powerpuff Girls. The “Tranz” video itself is a fever dream of psychedelic film reels, glitchy color-pitch animation and clay-model, stop-motion freak-outs. The video “is directed by Gorillaz co-founder Jamie Hewlett and co- director Nicos Livesey, with support from the extraordinary animation specialists Blinkink and Paris-based creative production powerhouse Eddy,” according to a press release. The Gorillaz will be continuing their tour through October, including an appearance at their own Demon Dayz festival in L.A. on Oct. 20. Their full tour slate is included further down. Albarn recently revealed Gorillaz have yet another new album on the way, following this year’s The Now Now and last year’s Humanz. Watch the video for “Tranz” below.